The Tactical Research Chrome series by Belleville answers the mail for law enforcement personnel asking for a lightweight, high performance at a great value. The Tactical Research TR996Z WP Chrome Waterproof Side Zip 6in Black Tactical Boot is ideal for cold and wet weather applications and features a highly breathable Gore Tex bootie that protects you from wet environments. A side zipper was redesigned for this boot with a straight design that permits maximum ankle movement and flexibility. The six inch height is ideal for officers looking for ankle support without the heat retension of a full height 8in boot. 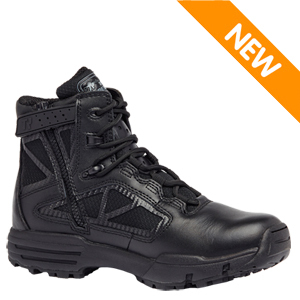 The TR996Z WP also features a durable TR StreetNav outsole that is made of 100% rubber oil and slip resistant rubber.